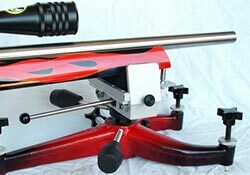 Shadetree’s joy-stick co-axial rest top, a favorite for bench rest shooters. The wide range of adjustments allows for 20 plus inches of vertical and horizontal motion at 100 yards. This is based on a standard bench rest type configuration of 28 inches between CL of the front and rear bags. Top of rest only: no base or bag included, shown for reference only.